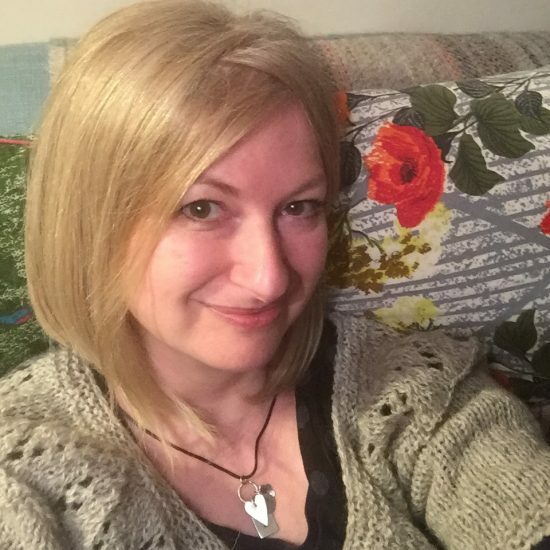 I am Sarah Berry and here at North Child I write knitting designs, facilitate fibre and textiles workshops, and make traditional Waldorf dolls. I sell my knitting patterns and doll kits on Etsy and Ravelry. I am fascinated by pure wool in all its manifestations; I love its many textures, its strength and delicacy, warmth and breathability, its highly-evolved waterproof, flame-resistant and anti-microbial properties – and its age-old links to people and cultures no longer with us. I grew up being knitted for, and photographs from my ‘70s childhood often include Aran bobble-hats and grey school cardigans; memories are still strong of nearly grazing my nose on the inside of polo-necks, and of the warm, hairy smell of bundled-up woollen layers on Bonfire Night. Whenever I design for children, I know that their sensory memories of the garment will long outlast its physical lifespan. As a little girl, I asked to learn to knit and was told to wait until I was seven. When seven came, and with it knitting lessons, they were a big anti-climax; instead of Aran-bobble hats, ever-widening garter stitch ‘things’ full of holes crawled painstakingly along my needles. I didn’t want to knit any more. But importantly, I had learnt how. Then, a few years later, I went to the village jumble sale and bought an old Fair Isle yoked cardigan with my pocket money. The children’s television serial of Nina Bawden’s novel “Carrie’s War” had swept me away, and I wore that cardigan constantly. It was far too tight around the shoulders though, and my mother explained why. That cardigan taught me two vital things: to love stranded colourwork, and to work it loosely. The second of those things only made sense about ten years ago, when my love for Fair Isle garments became just too much; encouraged by black and white photographs of tiny children makkin away outside crofthouses, I started knitting again. Seriously this time. And this time I could do it properly, and I soon understood how it worked and how I could make it work. And ten years later, here I am, making knitwear designs that have in them a bit of my childhood, a bit of the Northern Lands in which I live – and a lot of my love for pure, unique, enduring wool. As well as designing, I work part-time as an Art teacher in local Primary schools. Apart from spending my twenties in Brighton, I have always lived in the countryside: as a child, in rural Worcestershire, and for the last 20 years, on the West Highland coast. I have a small house in a small community, and a mountain view that fills the horizon. You can find me on Ravelry as Silkmonkey, or on my designer page.